Today's Image of Mars is of Arsia Mons, the southernmost of the Tharsis volcanoes. This volcano is larger than any on Earth, measuring nearly 12 miles high and over 270 miles wide. 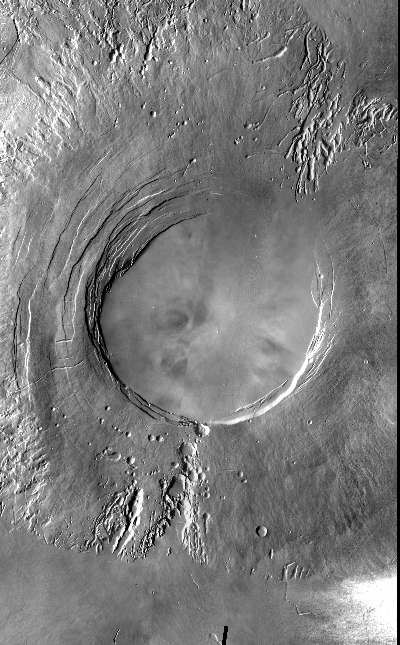 The fractures in the top right and bottom left of the image are aligned with Pavonis Mons and Ascreaus Mons to the Northeast. This may represent a large fracture or vent system that was responsible for the eruptions which created the volcanoes. This image was taken by the Thermal Emissions Imaging System (THEMIS) aboard Mars Odyssey Orbiter. The image was released to the public on June 13 2005. Click the image to see the original captioned image from THEMIS.